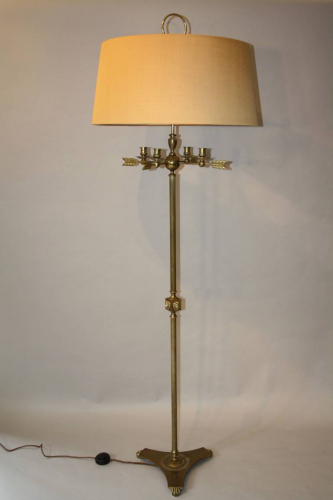 An impressive brass floor lamp with reeded column, arrow and candle detail as well as lion heads. French c1950. Shade width 59cm and base width 35cm. Shade has been recovered in "chipmonk" coloured silk. Lamp has been rewired and PAT tested and certified for UK use.